This Father's Day, give Grandpa or Dad a personalized gift that will show him how much his beloved kids and grandkids adore and appreciate him. Every morning, he can enjoy a cup of coffee out of a personalized mug that was given to him with love by his family. This Team Dad design is printed on our dishwasher safe ceramic coffee mug. This custom mug is large enough to hold up to 11 ounces of your favorite brewed coffee or tea. Free personalization of any text color, any title, number of kids and up to 30 names is included. Additional Details Surprise Dad or Grandpa with a personalized Father's Day gift that shows the undying love and support that he has from his family. Every morning, we can wake up with a loving message from his kids and grandkids. 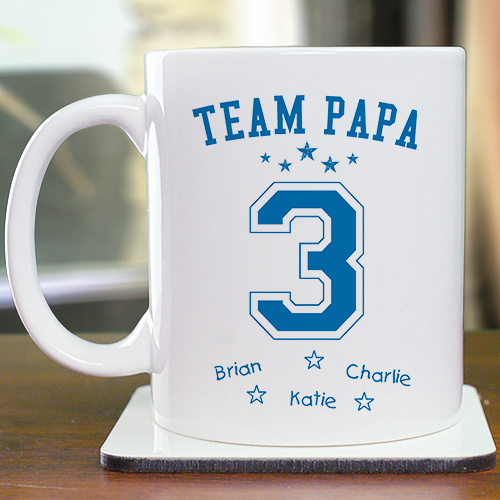 Our Personalized Team Dad T-Shirt is another popular gift option that matches our mug perfectly.